DANCE YOURSELF INTO THE TOON! 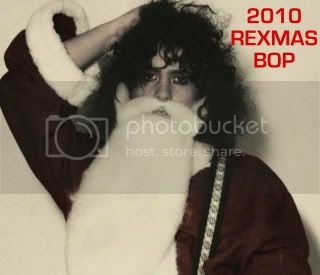 It's time again for the Official Marc Bolan Fan Club REXMAS BOP! Date- Saturday 5th December 2009. Live performance from the fabulous tribute singer Paul Feldon ('Stars In Their Eyes') & percussionist Ben. 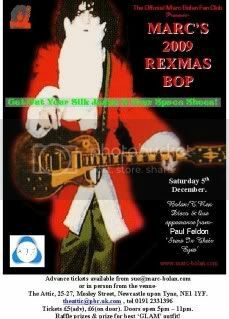 Bolan/T.Rex Disco with DJs Lindon & Wayne. Tickets £5.00 each (advance)/£6.00 (at the door). Please contact sue@marc-bolan.com for ordering details. Advance tickets also available from the venue (after 5pm). Raffle prizes & prize for best GLAM outfit! Get out your silk jeans & your space shoes! We have a raffle in aid of CICRA (Crohn's In Childhood Research Association). For any further information/directions/hotel list/enquiries, please contact sue@marc-bolan.com. "I Danced Myself Into The Toon"
and for Marc to be recognised by the Rock & Roll Hall Of Fame at http://www.petitiononline.com/bolanhof/petition.html . TICKETS AVAILABLE FROM THE VENUE NOW! sounds like a fun night ,i used to love mark bolan ..
your link doesnt work , it just says "The petition ID does not appear to be valid." ? or i would have signed it .. Following last year's great Glam night, we are returning to The Attic for this year's event! Tickets £6.00 (advance), £7.00 (at the door). To order, please contact londonbop@yahoo.co.uk. We have permission to use the club from 5pm until 11.30pm this year, which is half an hour more bopping time than last year! As last year there is an age 18+ restriction, & there will be an all-Bolan & T.Rex Disco with raffle (profits going to CICRA) & merchandise. The legendary Andy Ellison from John's Children & Radio Stars came along last year as a surprise guest & hopes to return again this year if possible.